Violet scientifically known as Viola odorata is a small bushy plant that belongs to Violaceae – Violet family. The plant is native to Europe and Asia, but has also been introduced to North America and Australia. From old ages it has been grown in gardens, and now it has spread to most of Europe. Some of the popular common names of the plants are Sweet Violet, English Violet, Garden Violet, Florist’s Violet, wood violet, common violet, garden violet, fragrant violet, sweet blue violet and violet. The scientific name of the genus “viola” comes from the Latin. In turn, it comes from the Greek word “Io”, who was the lover of Jupiter. Jupiter’s wife was jealous of her, so Jupiter protected her turning her into a calf that was fed in the meadow. For “Io” could eat well, Jupiter provided her with violets. The species name “odorata” (= smell) comes from the Latin and refers to the characteristic intense aroma that this violet produces. It is known for its medicinal properties and the many health benefits it procures the body. The sweet, unmistakable scent of this flower has proved popular throughout the generations and has consequently been used in production of many cosmetic fragrances and perfumes. It is commonly used as remedy for coughs and sore throat, hoarseness and tonsillitis. It is valued as an expectorant, diaphoretic, antipyretic, and anti-bacterial, diuretic and as a laxative, in bilious affections. It is used either alone or in mixture with other herbs for catarrhal and pulmonary troubles and for calculous affections. Both the legendary origin of the violet as well as its peculiar smell has been momentous to turn it into a symbol of love. There have been many lovers who have shown their love by giving violets to his beloved. The scent of violet has also been used to create love potions, with whom he could woo the woman he loved. Violet is a small bushy, hardy, evergreen, herbaceous flowering, perennial plant that grows about 4-6 inches (10-15cm) tall and 8 to 24 inches wide. The plant is found growing in field, woods, thickets, stream banks, old parks, gardens and roadsides, waste areas and lawn. The plant preferably grows in rich, humus-rich, cool and well-drained soil although they prefer moisture-retentive, rich soils. Stem are almost a leafless scape, scale-like bracts halfway or above. Violet leaves are palmate, alternate, and are somewhat an oblong heart or kidney shape. The leaf margin is serrated (toothed) and they do not have any hairs. They can grow to anywhere between 13mm and 50mm in width. Purple/blue tends to dominate the wild violets though they are also yellow and white. The flower has an inner white area and is somewhat hairy. Each flower slightly droops. Flowers bloom in early spring and usually by the time the temperatures get hot the flowers die off but the leaves remain. Flowers have five petals arranged with two upper, two middle, and one lower petal, which is often larger. There are many colors to be found: dark purple, yellow, white, beige, blue, even multi colored. Flowers are replaced by spherical, short-hairy, light purple, 3-lobed, approx. 7 mm (0.28 in.) long capsule. Scape curve towards the ground in fruiting stage. 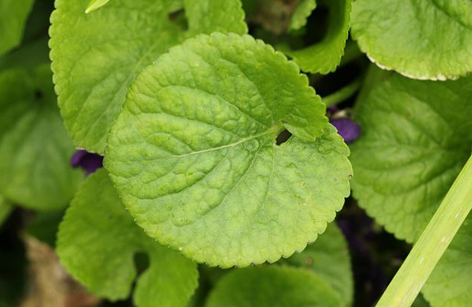 Leaves of violet plant are able to reduce blood pressure as it consists of alkaloids and flavonoids. Alkaloids have relaxing effect on blood vessel. As the result, we will have such an easier blood flow. As we know, the normal blood circulation prevents us from getting elevated blood pressure. On the other hand, flavonoids can act as diuretic which is useful for those with high blood pressure. It effectively reduces the high blood pressure. 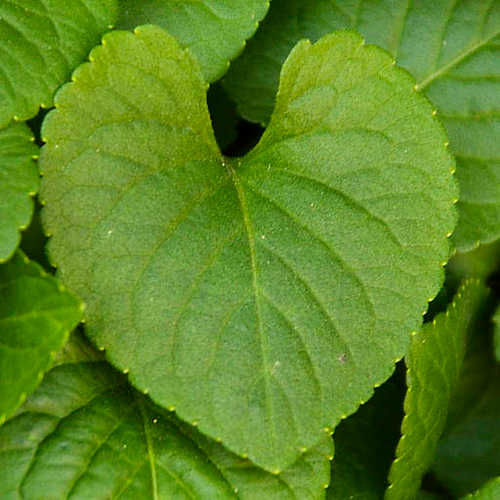 Thus, we can say that this heart shaped leaves is actually good for heart as the normal blood pressure will maintain the health of our heart. Research showed that violet leaves are beneficial to prevent and treat the early stage of cancer. It’d due to the high antioxidant level which is able to fight the free radicals as the main factor of cancer growth. Regular consumption of violet leaves is obviously able to reduce or shrink the early stage or tumor and cancer. Mucilage or soluble fiber in violet leaves is helpful to reduce bad cholesterol level. Besides, it is also good in improving the health of intestinal flora. Intestinal flora supplies the food for good bacteria which aid digestion. Dietary fiber is also able to improve the bowel movement and prevent some digestion problems such flatulence and constipation. 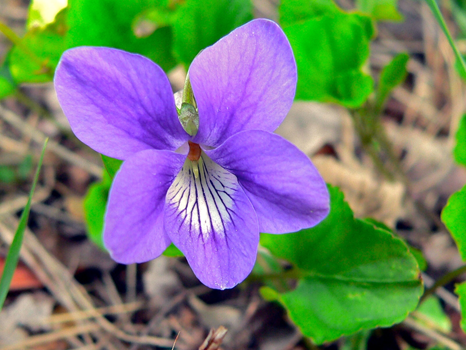 Violet flower is an important addition to your medicine chest during the cold and flu season. Syrup of the flowers can soothe an irritated and hot throat. It’s also a powerful lymphagogue that can relieve congestion and swollen lymph glands. 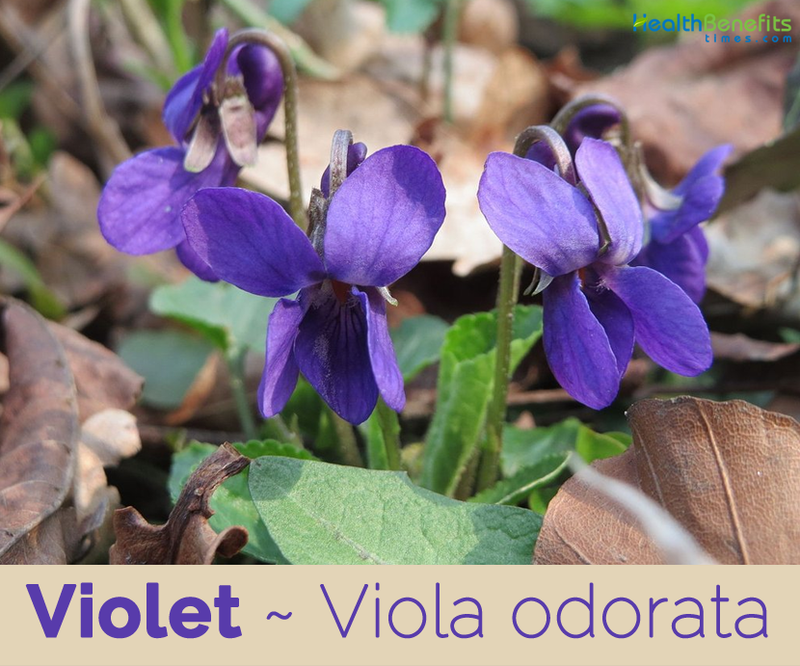 Cooling and mucilaginous, violet can be used for a dry cough and for ear infections. The plants are usually grown wild. But you should know that this plant is actually precious. We can prize the flower for its beauty and distinct color. Besides, we can also both use flowers and leaves for consumption need. It can give you nutrition and the health benefits of violet leaves. One of the health benefits of violet leaves is reducing inflammation. Leaves are a powerful anti-inflammatory property. It can ease sorts of inflammation such sinus infection, bronchitis, and sore throat. If you are tired of the unstoppable coughing, then Violet leaves may give you way to relieve your coughing. Decoction of violet leaves or hot violet tea can be a powerful expectorant as it contains beneficial value for pulmonary health such as mucilage and saponins. It is also a suggested cure for bronchitis. Leaves of beautiful violet flowers can be used as blood purifier. It means that the leaves are beneficial to boost the metabolism. Leaves also aid the fast waste elimination. Consumption of violet leaves encourages the lymphatic glands which helps flush the bacteria and the other unwanted material in the blood. Consuming violet leaves can also give a soothing and cooling effect. It is very good when you drink the violet leaves to relieve your fever. It can also relive fever due to the inflammation as the leaves perform a good anti-inflammatory property. Violet’s most famous use is to dissolve cysts, lumps, and fibrotic tissue of the breast. Herbalist Matthew Wood recommends a fresh poultice of leaves and flowers for cancers of the lymphatic system, breasts, lungs, and skin. 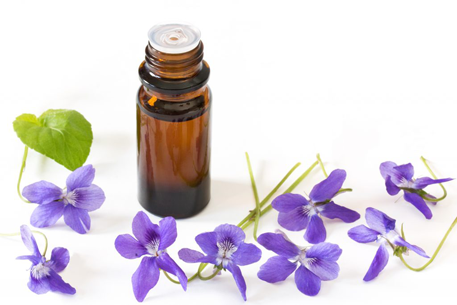 It is said that oil infused with fresh violets are used for dissolving lumps of the breast or simply as a preventive. Fresh violet poultice can be used externally for a variety of reasons. Abscesses, acne, arthritis, minor skin irritations, sores, and swollen glands are just a few of the possibilities. Violet leaves are rich with rutin. Rutin is often found in any remedy for hemorrhoid. It is because rutin performs great anti-inflammatory which ease inflammation in hemorrhoid. Rutin is also included into any medicine for varicose veins. Salicylic acids in violet leaves presents excellent painkiller while act as anti-inflammatory property. It performs the same action as aspirin to relieve pain in headache, arthritis, and the other pain due to inflammation. Leaves are also beneficial for skin. It presents the best treatment for some stubborn skin problems such eczema, psoriasis, and acne. In this case, you can use the leaves as topical remedy or compress. The leaves effectively soothe itching and inflammation on skin. 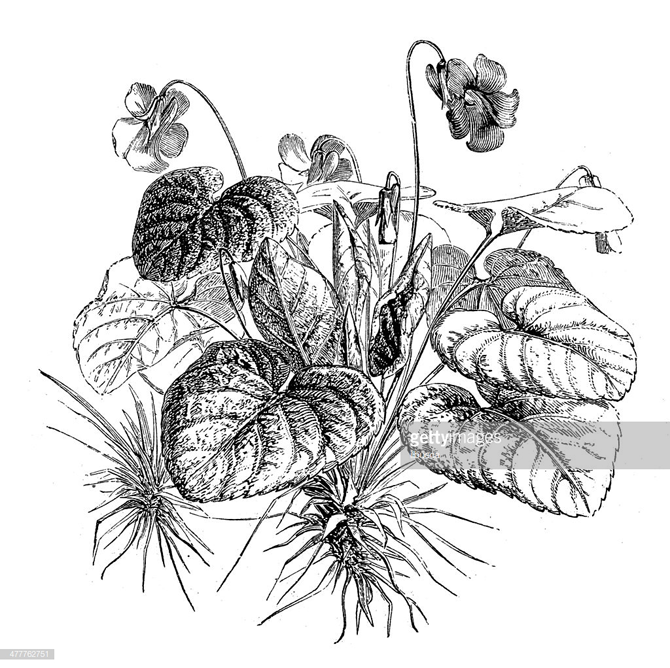 Sweet violet has a long and proven history of folk use, especially in the treatment of cancer and whooping cough. It consists of salicylic acid, which is used to make aspirin. It is effective in the treatment of headaches, migraine and insomnia. Whole plant is anti-inflammatory, diaphoretic, diuretic, emollient, expectorant, and laxative. It is taken internally in the treatment of bronchitis, respiratory catarrh, coughs, asthma, and cancer of the breast, lungs or digestive tract. 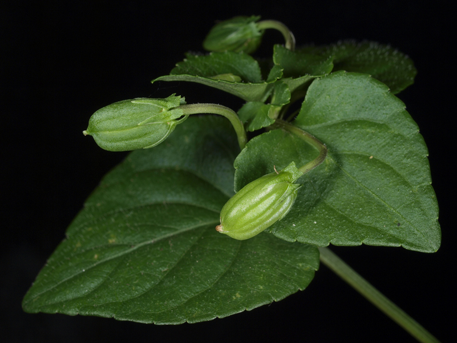 Externally, it is used to treat mouth and throat infections. Flowers are demulcent and emollient and are used in the treatment of biliousness and lung troubles. Petals are made into syrup and used in the treatment of infantile disorders. 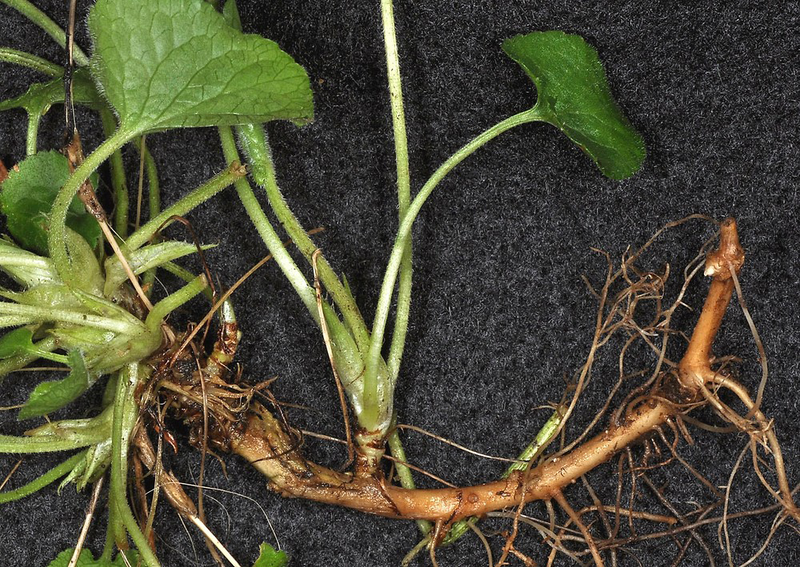 Roots are a much stronger expectorant than other parts of the plant but they also contain the alkaloid violine which at higher doses is strongly emetic and purgative. 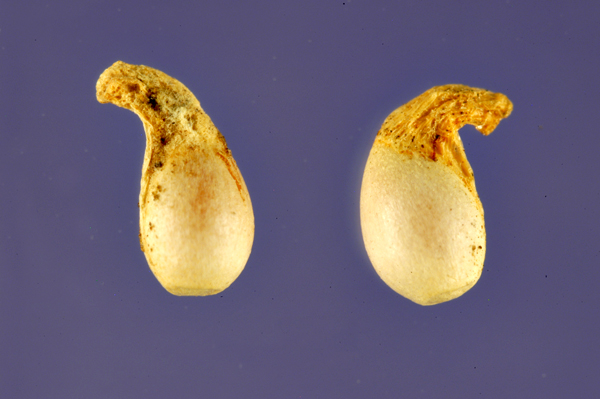 Seeds are diuretic and purgative. They have been used in the treatment of urinary complaints are considered to be a good remedy for gravel. Homeopathic remedy is made from the whole fresh plant. It is considered useful in the treatment of spasmodic coughs and rheumatism of the wrist. An essential oil from the flowers is used in aromatherapy in the treatment of bronchial complaints, exhaustion and skin complaints. An infusion prepared from 1 ½ oz. (50 g) violet flowers for 1 quart (1 liter) boiling water soothes irritation and cough. Violet is recommended in case of bouts of fever and flu symptoms. Violet is also effective in case of indigestion or food poisoning. Topical use of violet leaves and roots, pulped and used in the form of hot poultices is effective against small wounds, crevasses on breasts subsequent to difficult breastfeeding, and bedsores. 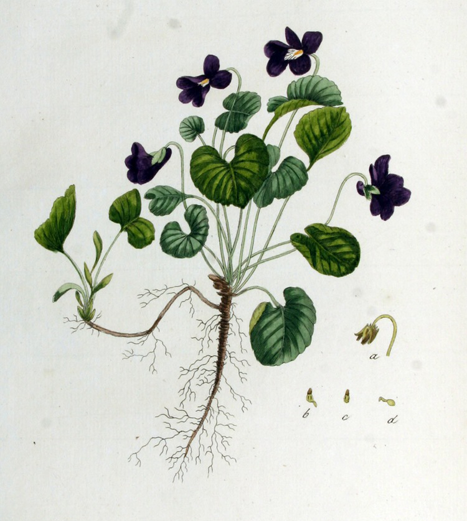 Violets offer the herbalist a useful lymphatic remedy that can help soothe stuck and stagnant congestion in the body. It is mostly valued for its ability to dissolve stones and to treat cancers of the breast, lung and digestive tract. It is also used to treat bronchitis and congestion of the lung, and as a pain killer (it contains salicylic acid), useful for headache. Standard infusion can also be used as a gargle or mouthwash to relieve soreness of mouth and throat. Poultice made from fresh leaves mashed up in a little hot water and wrapped in a piece of muslin or other closely woven material can be used to treat boils and other excrescences of the skin. Fresh or dried roots, crushed and steeped for several hours in vinegar are used to poultice sore, hot, infected feet and the feet of diabetics. Violet leaves can be muddled and put on bruises and wounds to help reduce swelling and lessen the pain of injuries. 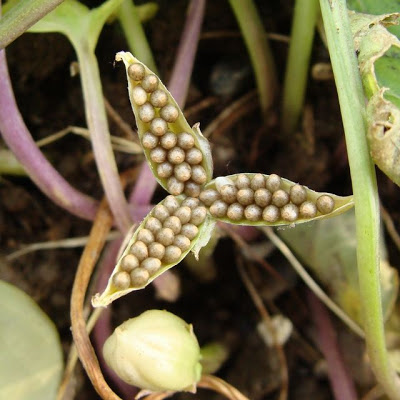 Young leaves and flower buds are consumed raw or cooked. Leaves have a very mild flavor; though make a very good salad. When added to soup they thicken it in much the same way as okra. Also used as a flavoring in puddings etc. Tea can be made from the leaves. Flowers are used to decorate salads and desserts. Flowers are an especially welcome decoration for the salad. Flowers are also used fresh to flavor and color confectionery. Soothing tea can be made from the leaves and flowers. Leaf extract is used to flavor sweets, baked goods and ice cream. Flowers can be made into jellies, candied, or tossed into a salad. 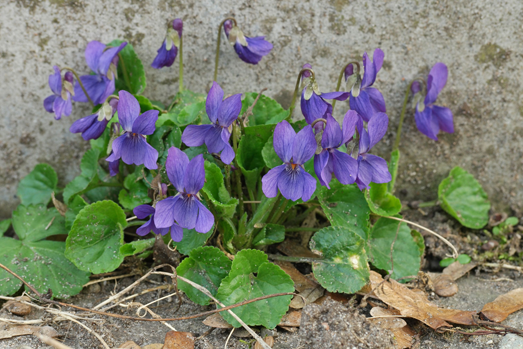 Crush fresh violets and apply topically; dried violet can be blanched in hot water to reconstitute. Mince an arbitrary quantity of fresh violet leaves and/or flowers in hot water and steep till drinkable. Steep 1 ounce of dried violet in 1 quart cool water for 3+ hours. Strain and drink. Pour a quart of boiling water over 1 ounce of dried violet. Steep 4-8 hours, strain, and drink (you’ll get mucilage from this preparation as well, as it will be extracted after the water cools). Infuse violet in water, and strain through a coffee filter to ensure no floaties (which are fine for drinking but not so fine for pouring onto your eyeball). To each 8 fluid-ounce cup, add roughly ¼ teaspoon salt. Stir till the salt is dissolved. 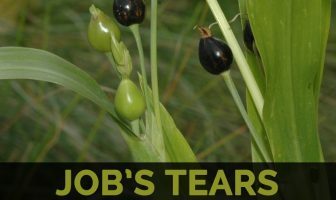 Use as an eyewash in an eye cup, in a nasal spray bottle or neti pot. Wilt fresh violet leaves/flowers, and infuse in your choice of oil or fat for a few hours to a day-ish over low heat. Violets frequently spoil when infused in mason jars in the sun because of their high water content, and even stovetop extractions can go off if any residual water isn’t removed before bottling. Check out Henriette Kress’s “Troubleshooting Herbal Oils” tips here for tricks and tips to avoid this potential bummer. Many tradition sources laud a combination of violet and rose flower infused oils… try it. Make a simple tincture by mincing fresh violet leaves and/or flowers and covering with 100 proof vodka in a mason jar. Macerate at least two weeks. Or, if you prefer, add 2 ounces of grain alcohol to every one ounce of minced fresh violet in a mason jar. Macerate as before. I probably wouldn’t tincture dried violets, though I imagine very recently-dried violet might be fine. Melt the butter in a pot and add the violet leaves, garlic, and onion. Cover and cook until the onions are soft. Carefully add the stock and heat. At this point, if you wish, you can blend the soup with an immersion blender or in a countertop blender. Pour into bowls, garnish with a few violet flowers and serve hot! Freeze into serving size portions. An ice cube tray works wonderfully for this. Use for easing grief, headaches, coughs, and constipation. An essential oil from the flowers and leaves is used in perfumery. Flowers are used to flavor breath fresheners. Pigment extracted from the flowers is used as litmus to test for acids and alkalines. Plants can be grown as a ground cover when spaced about 30 cm apart each way. They make an effective weed-excluding cover. Garlands of its blossoms worn around the heads of revelers were supposed to dispel wine fumes and prevent dizziness and headaches. 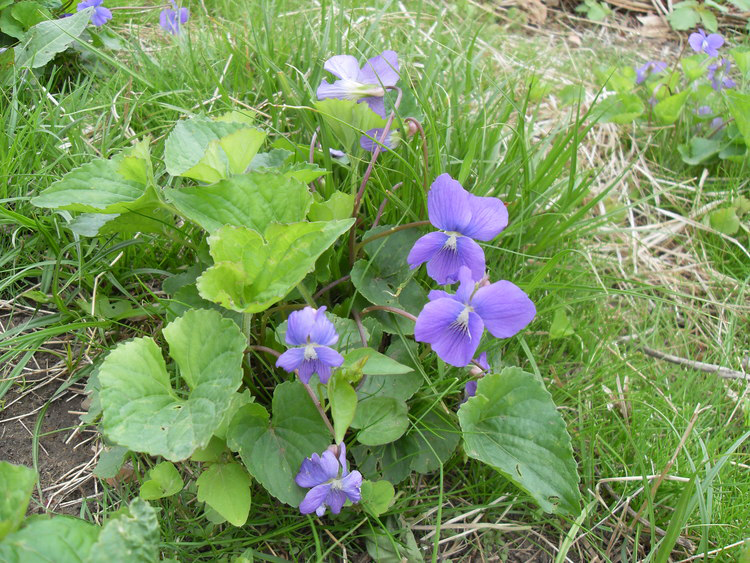 Flowers and leaves of violets are used to extract essential oil used in perfumery. Flower Flowers have five petals arranged with two upper, two middle, and one lower petal, which is often larger. There are many colors to be found: dark purple, yellow, white, beige, blue, even multi colored. For some folks, violet leaves can cause externally itching and irritation of the skin. Roots and seeds can be toxic in large amounts.